Tiny houses are easy to build, maintain, and inexpensive (if you build it yourself). 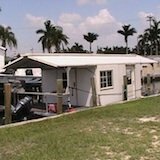 Since many are built on trailers, they are considered travel trailers (RVs) and do not require permits. The homes I feature here are usually 200 square feet or less. Anything that’s larger I place into the small houses section. I'll be talking about super small houses that are built on trailers, some converted sheds, small studios, and even backyard offices. Other uses that you might find are as space for hobbies and art. Some people have used them as galleries, music studios, a peaceful writing area, and more. I'll also cover the subject of construction plans and show you what's available in case you're interested in building one yourself. Scroll down below to explore! This is a place where you can submit your pictures and proudly show your house pictures to the world. I think you'll love this 10'x10' hilltop cabin in Australia that's only accessible by horseback and miles and miles of panoramic nature views. See how this net-zero home not only powers itself but also charges and runs the owners electric Chevy Volt with its solar system. Take a tour of Macy Miller's recently completed 232-square-foot little house on wheels designed for two +1. In 2010 Robin Falck wanted a tiny cabin that he could build on his land so that he can have an inexpensive getaway without having to get building permits. Here's what he did. Prefab micro dome houses that are made to setup in less than 4 hours. They're lightweight, easy to put together and can be mass manufactured. Faircompanies takes us to the compound where Dee's little abode sits and tell us how it's been living tiny for the last 9 years. Here's a one of a kind cabin that I like to call a collector's cabin because it's half artist showcase and half home. All while remaining simple. Tumbleweed has released a DVD that covers the basics of building a little cabin on wheels from start to finish! Preview it free here. Meet Greg Parham of Durango, Colorado and his new home and first official little house design... And there's more coming! Ever seen the original Walden tiny house that was designed by Jay Shafer? Now there's a slightly updated version you can get with dormers for more space in the loft! Ever wanted to learn how to build tiny by actually doing it? Here's your chance to do just that with 20+ other tiny housers! Where more than 20,000 new people got to learn about tiny living! A modern yet minimalist cabin in the woods. Built 4500 feet above sea level in Durango, Colorado. Check out what this cabin has to offer. Ella Jenkins' little home on wheels is one of a kind. See photos and watch a video tour right here. Check out Jenine Alexander's DIY house she built herself.. Using mostly reclaimed materials, Craigslist and a lot of creativity. If you enjoyed Jenine's project, you'll also like Matt's because he takes a similar DIY approach that focuses on reclaimed materials, low cost and creativity. Jay Shafer's new book based on his 6 new stylish box bungalow designs and how you can build them yourself. My review on the Small House Book by Jay Shafer. What you can expect out of the book and what I thought about it. I'll announce specials and sales on the book here as well. This is an always growing directory that I put together that lists all builders and manufacturers that I know of. Tiny Green Cabins offers a variety of homes from 32 to 250 square feet. More info and pictures within. 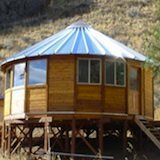 Tumbleweed is the creation of well known (amongst the tiny house community) Jay Shafer. His houses and designs are my favorite because of their attention to detail and thoughtfulness. They have a wide range of options to choose from, and each house seems to have this feel of home. Peter King lives in a tiny house in Vermont. He teaches workshops and promotes simple living. See the houses he's built. 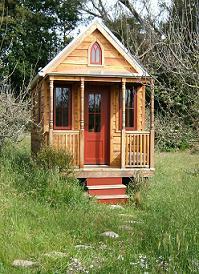 Tiny Texas Houses is another favorite which is founded by Brad Kittel. I found that this is one of the most interesting builders out there. These homes are almost 100% recycled, they are beautiful, all one-of-a-kind and Brad’s story is really interesting. Here I'll show you Yes Wee Cabins tiny houses. I'll introduce you to their owner and tell you about their products and services. Pictures, prices and contact information too. This is where I share construction tips that I’ve learned from my research. The best part is you’ll also be able to share your construction tips and learn from others too. 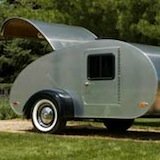 Tumbleweed is hosting a workshop with Dee where you can learn all there is to know about designing and building your own little house on or off wheels. 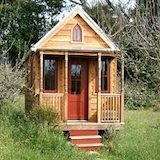 A collection of downloads related to tiny house living. It includes a few free sets of building plans too. Here there’s links and information on the available building plans that are out there along with your tips and advice. Modern and traditional gypsy caravan plans are now available so you can build your own gypsy wagon. I'll explain, show you videos, and introduce you to the Don Vardo Plans. I love to create and design my own floor plans so this is where I share them. I’ll also show you how you can create your own.